Get a limited-edition shirt commemorating Harvardwood's 20th! It was a pleasure to see many new faces at our March 21st event featuring Harvard Prof. Linda Schlossberg! Every seat was filled at Rideback Ranch, and a lively discussion followed Prof. Schlossberg's talk on dystopic literature. This month, we hope to get as big a turnout at our annual Harvardwood Helps event. Pitch in with Harvardwood Co-Founder Stacy Cohen AB '89 and friends, and volunteer at the Great LA River Clean-up on Saturday, April 13th! I repeat, April 13th! The April 1st weekly had the incorrect date (April Fools! ), so please take note of the correct Saturday date. P.S. If you're a Harvard undergrad looking for a summer internship, apply now! We are now accepting applications to receive a 2019 Heroes grant. The deadline to submit your grant proposal is April 15, 2019. The Harvardwood Heroes program awards $500 grants to applicants who have demonstrated a distinguished level of service to their organizations of choice. Every year, grant winners will be determined by the strength of their proposal. They will receive the first $250 upon announcement of the winners and the balance of the grant upon submission of a final essay six months later. The application period for the HWP-Features program in Los Angeles opens March 25th! The group will meet one to two times a month beginning in April, with the goal of getting your project to the next level, whether that's creating an outline, revising scenes, or finishing a full screenplay. Only Harvardwood members are eligible to apply (non Friends of Harvardwood). For the next twenty days only, get a limited-edition shirt commemorating Harvardwood's twenty years! You can select from a variety of styles, sizes, and colors. Check out the shirts here at Bonfire and spread the word to your fellow Harvardwood friends. Please buy a shirt in support of Harvardwood—they make a great addition to your wardrobe and are an easy gift too! 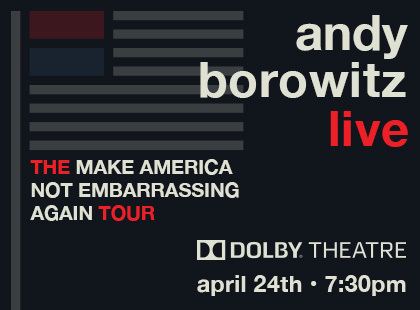 NYT best-selling author and comedian Andy Borowitz AB '80 is on the road with a special live show, The Make America Not Embarrassing Again Tour! See him in Los Angeles at the Dolby Theatre on April 24th, with the chance to get VIP tickets for a post-show photo op with Andy. This month will be the PBS premiere of Reconstruction: America After the Civil War by Harvard Professor Henry Louis Gates, Jr. At Harvard, Prof. Gates is also the Director of the Hutchins Center for African and African American Research. The four-hour documentary series will begin with Part One on April 9th, followed by Part Two on April 16th. From PBS: "The series will explore the transformative years following the American Civil War, when the nation struggled to rebuild itself in the face of profound loss, massive destruction, and revolutionary social change." Spring has brought with it two film premieres for Peter Lawson Jones AB '75, JD '80. Crshd, a comedy about romantic hijinks on a college campus in which he plays an astronomy professor, will premiere at the Tribeca Film Festival on April 30th. The Visit, a documentary that Peter co-executive produced and in which he is interviewed, premiered March 24th in Cleveland, Ohio. The film chronicles the historic and controversial 1965 speech by Dr. Martin Luther King, Jr. at a church in Shaker Heights, Ohio, believed to be his first address at an all-white church. Amazon series The Boys starring Elizabeth Shue AB '00 will premiere at Tribeca Film Festival this April. Watch the official teaser for the show! Underground 68, the new film by Peter Coonradt AB '68, premiered to a packed house at the Brattle Theatre in Harvard Square on February 27th. The film stars Ariel Smolik-Valles AB '17, whose senior thesis about campus opposition to the war in Vietnam leads her into the world of the 1960s counterculture, seen through the lives of artists, musicians, and activists from the Harvard Class of 1968. Co-producer is Harvard Classics Professor Richard Thomas, author of the acclaimed book Why Bob Dylan Matters. Kiran Deol AB '06 has been cast as one of the co-leads opposite Kal Penn in NBC series Sunnyside! Michael Schur AB '97 (Creator, The Good Place) is among the executive producers of the single-cam comedy. Don't miss this New York Times article by Crazy Ex-Girlfriend co-creator and showrunner Ailne Brosh McKenna AB '89. And New Yorkers, you can catch her at the live Crazy Ex-Girlfriend show at Radio City Music Hall next month! March 31st was the premiere of the final season of Veep, helmed by showrunner David Mandel AB '92. Reviews are on fire, and David has been featured in several great interviews about the acclaimed HBO series—we wish the show didn't have to end! Netflix has ordered to series an untitled comedy from rapper/comedian Lil Dicky, co-created alongside Jeff Schaffer AB '91 (Seinfeld, Curb Your Enthusiasm; Creator of The League). Marty Bowen AB '91 will also executive produce the series. Nappily Ever After, a Netflix film from producer Tracey Bing MBA '01, received two NAACP Image Award nominations, for Outstanding Actress and Outstanding Independent Motion Picture. The 50th annual NAACP Image Awards ceremony was held on March 30th. Anywhere you look, you can't miss John Lithgow AB '67, Ar.D. '05! Bleecker Street recently released the trailer to drama film The Tomorrow Man, in which Lithgow stars as a doomsday prepper; the film will be released later this spring. 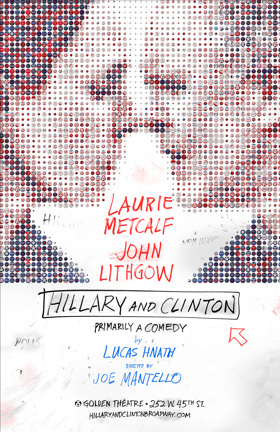 April 18th is the official opening night of Broadway's Hillary and Clinton, featuring Lithgow as Bill. And finally, demonstrating the breadth of Lithgow's projects, he stars in the feature film adaptation of Stephen King's Pet Sematary, set to release in just a few days! HWP-TV module participant and leader Megan McDonnell AB '14 was featured on a recent episode of the podcast ScriptNotes, discussing the road to getting staffed! Peter Limm AB '06 and Harvardwood 101 alum Min-Woo Park AB '16 are among the writers selected for the eighth annual CAPE New Writers Fellowship Program. This year's program mentors include Daniel Chun AB '02 (Grandfathered, Speechless). Cristina Slattery is currently based in New York where she works as a freelance writer and educational consultant for international students. Her non-fiction articles have appeared in the New York Times, the Wall Street Journal, Newsweek Japan and on websites such as Afar.com and Words Without Borders. She has also written a Middle Grade fantasy novel and is hoping to see it published soon! Join Harvardwood Helps at Friends of the LA River's 30th Annual Great LA River CleanUp! We'll be working at the Glendale Narrows Riverwalk, located within the scenic 11-mile natural bottom Glendale Narrows stretch of the River. The Riverwalk is a landscaped recreational trail, perfect for pedestrians and bicyclists, running along the north bank of the River across from Griffith Park. The Riverwalk currently includes 2 small parks, an equestrian facility, and public art installations, and there are projects underway to extend the trail and even construct a bridge across the River to Griffith Park! FoLAR provides trash bags and gloves, but you can bring your own gloves if you prefer to use them. They will have plenty of water at each site, but please be sure to bring your own reusable water bottle! They also have some snacks for volunteers to enjoy. FoLAR gives volunteers a t-shirt and a reusable bag! However, supplies may be limited and are given out on a first-come-first-serve basis. 25 million Americans have creative dreams. Whether you've been bitten by the creative bug or are an aspiring, working, or successful creative professional, Jim Jermanok will tell you how to make your dreams a reality and how to get to the next level of your creative career without relying solely on agents, managers, producers, and other gatekeepers. Jim Jermanok is an award-winning writer, director, producer, creative consultant, and speaker. He is currently directing a feature documentary about Oscar-winning actor Martin Landau. He wrote and produced the highly acclaimed romantic comedy Passionada, and his recent film Em won the Grand Jury Prize at the Seattle International Film Festival. His web series LIFEADVICE.TV has been widely praised since going live globally. Mr Jermanok is a former ICM agent, who helped to represent Arthur Miller, Shirley MacLaine, John Chancellor, Ben Kingsley, Dudley Moore, Helen Hayes, and General H. Norman Schwarzkopf, among others. There is probably nobody, other than perhaps the Justices themselves, who knows more about the Supreme Court than Linda Greenhouse AB '68. One of the most widely admired journalists of our time, Pulitzer Prize winner Greenhouse spent 40 years writing for the New York Times, 30 of them covering the Supreme Court. In addition to the Pulitzer (1998, for beat reporting), her many awards include the 2002 Carey McWilliams Award from the American Politcal Science Association for "a major journalistic contribution to our understanding of politics", and the 2004 Goldsmith Career Award for Excellence in Journalism from Harvard's Kennedy School. Since 2009, she has been the Joseph Goldstein Lecturer in Law and Knight Distinguished Journalist-in-Residence at Yale Law School. She continues to write a biweekly op-ed column on law for the New York Times. Linda Greenhouse will speak about the Supreme Court and her experiences as a journalist covering it. Attend our networking mixer for attendees of the 2019 Harvard College Film Festival and Harvardwood members and friends! Light refreshments will be served. Film lovers, students, and community members are all welcome! The event will be held at Ticknor Lounge in Boylston Hall (Harvard Yard). The 2019 Harvard College Film Festival will run from April 25-28, 2019. This art retreat is open to all levels, from beginner to advanced artists, who would like to experience the creative inspiration of sculpting the figure in clay. The human form has been a core source for the creative communication of our existence since the dawn of history. Working in clay, from a live model, this course will explore the figure and methods for creating from it. Students will work both short and long process studies, learning how to develop ideas about the figure. Classes will also feature practical technical instruction and the possibility for finished pieces to be cast in plaster, bronze or even carved into marble, for an additional fee. Arriving on Sunday, April 28, classes start on Monday, April 29 and continue to Sat May 4th, with departure on Sunday, May 5th (6 days tuition, 7 nights accommodation).